Ginkgo is medium sized deciduous tree with beautifully fan shaped leaves which develop a clear yellow fall color. Its form is pyramidal, broadening with age and becoming picturesque. 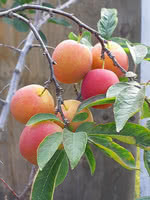 Patterson Pride Plum is a fruit tree with weeping branches. This hybrid plant needs a wild plum tree for cross pollination before it can produce fruit. Patterson Pride's fruit is much larger and sweeter than other hardy plums, excellent for fresh eating, baking, jamming, and drying. A healthy tree grow ripe fruit in late summer and will not drop any fruit on the ground. We recommend pairing Patterson Pride with Pembina Plum as these varieties cross pollinate well with each other.